At least that's the hope of those who elected Andre's Manuel López Obrador, aka AMLO, aka Peje, on a platform of sweeping out the corruption -- a platform promoted in Obrador's book, A New Hope for Mexico. That Barack Obama did not permanently decommission the word "hope" for credible electoral campaigns on this continent may be the least of the book's surprises. 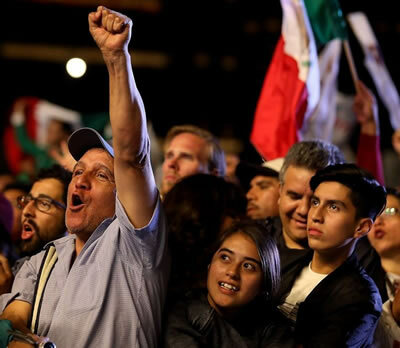 Thus far 14,000 people in the United States have signed a letter that has made news in Mexico congratulating Obrador on his victory. Donald Trump is not one of them. Obrador campaigned against the Trumpian menace, denouncing his statements and policies toward Mexicans as akin to Hitler's statements and policies toward Jews. While campaigns against foreign targets typically move a nation to the right, this one moved Mexico to the left. But, then, Obrador's platform -- unlike, say, that of the Democratic Party in the United States -- is not simply anti-Trump. There's a lot more to it. In his book, Obrador denounces Trump's budget proposals as moving money from housing, transportation, education, heath, justice, agriculture, development, and environmental protection to the military. Already he's ahead of most Democrats who have pretended Trump was "cutting" the federal budget and acted as if the military didn't exist. Obrador goes on to blame this shift in priorities for the poor quality of life in the United States in comparison with Ireland, Norway, Sweden, Iceland, Denmark, Italy, and Spain. "Why, instead of blaming migrants," asks Obrador, "don't politicians speak honestly? . . . I am sure that the problems that plague Mexico and the U.S. could be resolved were the governments of both nations to commit to overcoming inequality, poverty, and corruption in their respective territories." "In recent years," writes Obrador of Northern Mexico, "we've seen a policing problem escalate into a full-fledged 'war' that has claimed thousands of lives without achieving anything at all. . . . No one has been held accountable for the vast majority of these deaths." Despite peppering his book with such "nobody's been held accountables," Obrador also includes an Obamesque promise of immunity for all crimes due to the importance of looking forward. Yet most of his book could never be called Obamesque. He begins with a discussion of what Obama would call "our founding fathers" or "wise Wall Street advisors," but Obrador refers to the Mexican equivalents of these groups as "a gang of thugs." And he names names, including those of many previous Mexican presidents and various Mexican oligarchs. The new President of Mexico says that migrants die in the Southwestern United States just as in the Mediterranean, but that U.S. media has a preference for one over the other. His comments on Trump's incitement of racist violence are equally honest. Obrador made many of these comments in speeches in the United States, from which the book is compiled. He has countless kind things to say as well as tough ones. Not only does he cite the example of Franklin Roosevelt's New Deal in positive terms, but he even praises Woodrow Wilson as a global peace maker, omitting entirely his racism, his horrendous failure to shape a just peace at Versailles, and even his military adventures in Mexico. Trump, writes Obrador, is acting like a Nazi, and his policies are criminal: "The plans to construct a border wall and persecute migrants in this country are in violation of the Universal Declaration of Human Rights; the International Covenant on Civil and Political Rights; and the International Covenant on Economic, Social, and Cultural Rights." On March 15, 2017, in Washington, D.C., Obrador brought a complaint signed by over 11 million Mexican and U.S. citizens to the Inter-American Commission on Human Rights challenging two executive orders by Trump from January 25, 2017, alleging that the orders "violate the presumption of innocence, disregard the right to asylum, ignore due process, and omit protections relevant to child migrants. . . . The United States of America is subject to its obligations under the American Declaration of Rights and Duties of Man according to the Statute of the Inter-American Commission on Human Rights as set out in Articles 20 and 51."